I have to be honest, I wasn’t completely sure if this release merited a review or not. I mean, it was just in the middle of 2006 that Leatherwolf released their comeback album, World Asylum. So, what’s the difference between that album and this one? Well, since the release of World Asylum, the original members of Leatherwolf have reunited. That includes original vocalist Michael Olivieri. Drummer Dean Roberts explained at the time that World Asylum is exactly what motivated Olivieri to get back into metal again. In fact, he enjoyed the songs so much (and singing them), that the somewhat unorthodox decision to rework World Asylum with Olivieri’s vocals went forward. 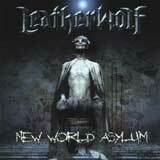 Of course, New World Asylum is the first Leatherwolf studio album with Olivieri on lead vocals since 1989’s Street Ready. Soon after the release of New World Asylum, the prospects for an all original lineup continuation of Leatherwolf went down the drain. Sadly, lead guitarist Geoff Gayer’s drunken behavior led to his dismissal from the band following a live performance late last year. According to a new release from the band, Gayer’s “drunken stupor” caused that show to be cut short, and the band labeled that show as the most embarrassing of Leatherwolf’s career. Currently, the band is auditioning for a lead guitar player. On the bright side, all 4 remaining original members remain in the band at this time. Of course, the main selling point of this album is the replacement of Wade Black’s vocals with those of Michael Olivieri. With the exception of some very minor tweaking here and there, the song structures themselves are nearly identical to those found on World Asylum. It was a bit strange at first to hear these songs performed by Olivieri, as he and Wade Black are two distinctly different singers. This is easily the heaviest material that Olivieri has performed, and he does an excellent job tackling this new challenge. One item of note is that he almost entirely stays out of the higher octaves that frequented on the first three Leatherwolf albums. His delivery is much more aggressive that anything we’ve heard from the man before. He really sounds like he’s pushing his voice to its limit, but never overreaches to the point where the sound quality deteriorates. What kept coming to mind while listening to this album is what Dean Roberts commented about World Asylum’s affect on Olivieri. That album, fronted by Wade Black is what got his metal juices flowing again. You can truly hear that emotion emanate from Olivieri throughout this album. He puts every ounce of emotion and vocal ability into his delivery. Having said that, I can honestly tell you that this album is not just some cash grab attempt by the band. This is something that Michael obviously wanted to do, and he certainly put his heart into his work. The resulting benefit for fans is quite obvious as well. Sure, there is a novelty factor is having the original vocalist offer his take on this album, but it is an impressive performance as well. We are treated to a side of Olivieri that has not been heard on previous Leatherwolf albums. As you can tell from what I have written, New World Asylum is a worthwhile addition to any Leatherwolf fan’s collection. This had sneaked under my radar at first, but I am thrilled to have finally got my hands on this one. Rest assured that this release is sales gimmick based solely upon Olivieri’s return to the band. There is plenty of substance here to justify the purchase of the album. While I will always appreciate the fine job Wade Black gave us the first time around, the Olivieri versions stand up on their own very nicely.